It had to happen. No election is complete without Ranil Wickremesinghe saying something really, really funny. A few days ago he said that Mahinda Rajapaksa and the UPFA had the hardware (the state apparatus) while he and the UNP had the software (strategies to turn things around). When I read the headline ‘Mahinda has the hardware, I have the software,’ I could almost hear a chorus of voices interjecting, ‘that is not news’. Jokes apart, we need to ask if he’s correct in his assertion. Wickremesinghe claims he’s got brains. Indeed, I distinctly remember posters claiming that he was an expert economist. He is claiming that he has more grey matter than the rest of the competition. Let’s check his story. I am going to ignore all his foot-in-the-mouth statements which, sad to say, makes Dan Quayle look quite wise and prophet-like. Let’s see what the software (alleged) produced. Ranil’s software works in strange ways and always has. It has certain inherent limitations which can be broadly described as Fifth Lane Mentality or Cambridge Terrance Prerogative. This is why Ranil Wickremesinghe, ever since he made it to Parliament in an anti-SLFP surge in 1977, has acted as though Sri Lanka is made up of the four or five electorates within Colombo’s municipal boundaries. That’s how we got the White Paper of Education, which spawned the now famous characterization of the UNP’s general perception on ‘development’: kolambata kiri, apata kekiri. He was absolutely and rabidly against the idea of equal opportunity. Fancy stuff was for Colombo kids; drudgery for the village children. Indeed, the man operated as though the word village was somehow necessarily associated with idiocy. He was creamed by the ‘village’ in some 20 elections over the past 16 years, for the record. This software whiz-kid was the one J. R. Jayewardene chose to introduce the 13th Amendment to Parliament and he was ‘smart’ enough to leave out key paragraphs in the document. I don’t know if it was hardware of software or both that were associated with Batalanda and if those who were tortured were soft or hard or whether the process hardened or softened Ranil Wickremesinghe. I do know, however, that the outcome of his softness on the LTTE resulted in the free flow of a lot of hardware to the LTTE leadership and among LTTE cadres and that their deployment made life hard, really hard, for the children and families of the victims. I am not sure if he was hard or soft when it came to the Millennium City betrayal. I do know that he must have been quite soft in the head to sign that agreement with Velupillai Prabhakaran on February 22, 2002, easily the most horrendous act of treason in our post-Independence history. The man was ready to divide the country, I remember, and he was citing ground realities and waxing eloquent about having to have perspective and the need to get the economy going. Well, the hardware guy delivered all that didn’t he? Ranil is soft. Softly he whispers into international ears about how bad things are in Sri Lanka. He might be thinking, in his soft-hearted way, that he is hurting Mahinda Rajapaksa, but he was hurting Sri Lanka and Sri Lankans. Well, he was not exactly hurting the Sri Lanka he knew (Colombo) and the Sri Lankans he thought were worth the bother (Colombans, i.e. the Ostrich-types in Colombo 3 and 7 who are the hurrah-boys and hurrah-girls of gaja-mithuru capitalism and think the world is made of a single colour, green). He would not do that of course. Ranil was always soft on the rich, hard on the poor. Indeed he treated the less privileged with a kind of paternalism that was nauseating. He frequently insulted their intelligence and took pot shots at their sense of dignity, assuming that promising bracelets and necklaces would be sufficient to win their vote. The software that the man has purchased or developed allows him to talk about economic mismanagement, corruption, lack of transparency and accountability, while remaining the worst manager of the United National Party and the one leader who does not believe in presenting audited accounts to the party subsequent to elections. Ask him how Akila Viraj Kariyawasam acquired his properties and Sagala Ratnayaka his house and he might look the other way. He is described as the most arrogant leader the UNP ever had. That’s a virtue? An expression of ‘softness’? Do we need a darling of those nations that are hell bent on plundering our resources and compromising our sovereignty and territorial integrity? No, we don’t, and whether or not he is hard or soft, is irrelevant. 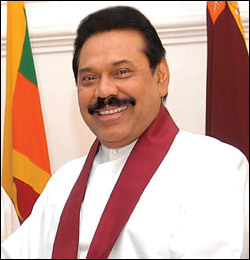 His software decreed that he would not get into a battle with Mahinda Rajapaksa. Instead, it suggested that he send a decorated soldier into a battle he was ill-equipped to fight. His ‘software’ ensured that Sarath Fonseka bit the dust. His software told him, ‘drop him immediately’ the moment the results were out. His software didn’t come up with a solution to the exodus of some 25 MPs. It didn’t tell him how to be a better leader, even under harsh political circumstances. Is that the soft-brained stuff that we need at this point in our history? We don’t have the best government in the world, but neither do we have the worst. After all, it’s a government under whose stewardship the world’s most ruthless terrorist outfit was comprehensively trounced. On the other hand, with Mr. 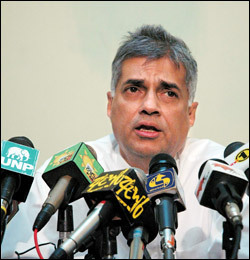 Softness Wickremesinghe at its head we probably have the world’s worst Opposition. Makes me want to renew an offer I made the UNP in six years ago. I figured the UNP needed a new leader. I am no politician, but I think I could do a better job. Well, so could Ranjith Madduma Bandara: he used Tippex; Ranil was cute and got people to sign undated letters of resignation. I wonder if holding would-be MPs to ransom is part of the software package that Ranil has acquired recently. ‘Inherited,’ did I hear someone say? Perhaps. J. R. Jayewardene, his uncle, got all his MPs to sign letters of resignation (undated). I wonder if Ranil was able to get people like Rauff Hakeem and Mano Ganeshan to ‘enjoy’ the same privileges of slavery that he’s forced down the throats of UNP candidates. Softly. That’s all we need to say about soft and hard. For now.